Building a brick-and-mortar structure is costly, no matter what the scale. St. Louis-based Arizon saw this as a chance to sell a pioneering product, that is air structure. Air structure is basically a structure of inflated air supported by a series of clamps and cables to maintain its durability and strength. With this structure, Arizon claims that they only charge about one-tenth to one-fiftieth the cost of the average price for a standard building. Its cost-cutting ability did not come only from the price of material but also from the drastically-cut project completion time. Arizon air structure can inflate within mere hours while building a standard structure may take several weeks in the least. 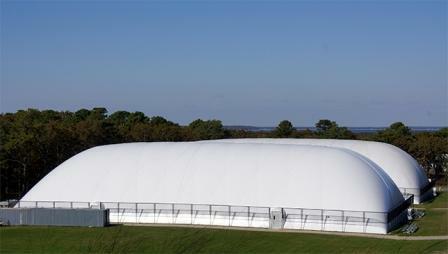 Another plus point for this air structure is its adaptability. Creating new extensions is as simple as detaching and reattaching the fabric and cable grids. Arizon air structure seems phenomenal and logically speaking, this product has its potential to bloom. However, we must remember that most people do not believe that air structure is safe since people are used to the concept that a building has to be physically rigid. To prove it wrong, Arizon is planning to build its own factory, using its own produced air structure.